Our Wedding was amazing, we are really pleased how smooth everything went and a big part to be thankful for belongs to Rob, our DJ. Rob was not only the one who made our Wedding so fun and lovely to attend by choosing the great music, but he also helped us being partially the MC, doing announcements and helping us to coordinate our 40 guests! We first met Rob on skype for a short interview. The way Rob communicates makes you feel that everything is so easy and everything will be taken care of. He suggested a few special songs for cake cutting, flower and garter, grand entrance, final song, etc. Rob responds fast, listens to what you want and just delivers anything you ask for! He also spent some of his free time to come see us some days before the wedding to take the songs from our computer, as he wanted to be ready and prepared before out special day. So we would definitely recommend Rob for your wedding or any special event. You can send him a list of your favorite songs or just give him a hint, and he will create a playlist especially for you. Hi Rob thankyou for the other night all our friends and myself could not rate you hi enough, your variety of music was awesome you looked great and you presented well, loved the way we could ask for different song choices and you had them all. Dj Rob Soundz absolutely exceeded our expectations and helped us make our wedding an unforgettable experience for us and our guests. 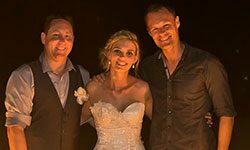 We were referred to Rob by our wedding planner (Katrina from Bali Weddings International) when we told her how important it was that we had music that everyone could dance the night away to. 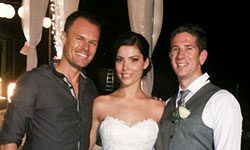 I emailed Rob and we organised a time to meet when we travelled to Bali two months before our wedding to make the final arrangements. When we met Rob he was extremely friendly, professional and easy going. As per Rob’s advice, we gave him a list of songs that we might want played during dinner service and party time. After quickly looking at it, Rob knew exactly what we wanted. It was very clear that he was a talented DJ! I was planning on asking a family member to MC our wedding but after meeting Rob, we decided to ask him to do it so everything ran smoothly. Between our meeting and our wedding, we emailed Rob about our specific song choices for cutting the cake, speeches etc and he responded in a timely manner each time. On our big day, we were standing in the garden waiting for our bridal party entrance. We could hear Rob having fun with our guests and creating a great atmosphere. Throughout the night, his announcements ran smoothly into the next song and all specific song choices were adhered to. We knew we made the best decision to have Rob as our MC and our guests loved him! Very early on in the night I had guests coming up to me and saying how much they loved every song so far! The additional services of the disco lights etc were amazing and added to the party atmosphere. As the night carried on and the real party music began, Rob read the crowd perfectly and had everyone on the dance floor all night! We could not have been happier; except that meant we wasted money on our dessert buffet! He accepted all song requests from our guests and was extremely approachable. I would recommend DJ Rob Soundz to anyone and everyone. Due to Rob’s talent and professionalism he could create an atmosphere to suit any couple and their wedding. Thanks so very much, Rob! We were very happy with your DJ’ing. On the day itself, your music selections mixed seamlessly with ours, the timing was perfect- as was your judgement of the mood. The result: people didn’t stop dancing all night! We also really appreciated your stepping in as MC for the after party. In the lead up to our big day your communication with us was clear and you made yourself available when we needed for meetings and correspondence. 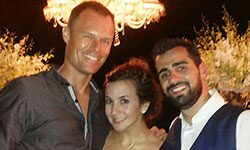 We would have no hesitation in recommending you and your company to other couples. We had Rob at our wedding recently. He was awesome! He arrived early to set things up, always had a smile on his face. My pool party was a success and all my guests enjoyed his music. He even played a little longer for us. Highly recommended! You were completely awesome, thanks so much – you totally nailed what we wanted and our guests (those who can remember the night…) invariably remarked on the quality of your set, it really set the tone for the night. Thanks again, Rob – you really made the whole night just ridiculous fun, we can’t thank you enough! Communication prior to the wedding was excellent. Skype call was set up on time and it was super easy to get our requests across to you. Set up and organization on the day of the wedding, were all done accordingly with no delays. All song choices and agreements / requests made prior to the wedding were followed as planned. We were super satisfied with the vibe of the party, flow of music and songs played. You were very friendly and professional. 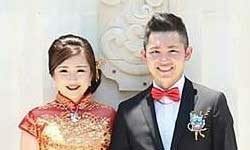 Easily approachable and acted in a proper manner throughout the wedding. You were very flexible prior to the wedding in playing different songs and Genres. All requests were met during the wedding party. We will most certainly recommend you to other couples / people if asked. Finally, we would like to thank you for an awesome time. We were super happy and satisfied to have you as our Wedding DJ. Everything went as smooth as possible and you made the whole process super easy on us. 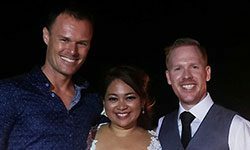 We were introduced to Rob through our wedding planner and from the get-go we found him to be extremely responsive and helpful when it came to the entertainment portion of the wedding. His suggestions were spot-on and we welcomed his knowledge and experience in dealing with large crowds. The vibe at the venue was incredible and the dance floor always busy – Rob was extremely professional throughout and we found him to be a genuinely great guy. We wouldn’t hesitate to recommend his services. 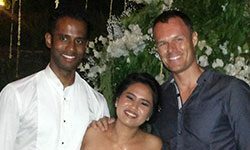 We had Rob DJ at our Bali Wedding on 27th June at The Sanctus Uluwatu. Where to start! From my first point of contact with Rob he answered all questions and was very helpful. He did an amazing Job at our wedding and it was one less thing for us to worry about. Many people commented on how great he was which is always a bonus! Rob played heaps of requests from our guests which i think was really important. Rob also did a few announcements too which were much appreciated. 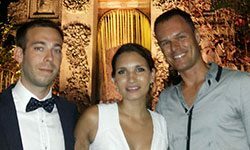 I would highly recommend Majestic Wedding and event DJs to anyone having an event in Bali. Thanks for making our wedding a great party! Rob did a great job with the music for our wedding. He took the time to understand what music we liked and importantly what we didn’t like. So many of our guests commented on the great music selection. He played a great mix of songs combining our own requests with lots of great tracks that we loved but had forgotten to ask for ensuring the dance floor was packed from first dance to the very end!